"Science is to know things.” HERODOTUS. "Knowledge is developed by experience from innate ideas.” PLATO. JOHN WORRELL KEELY the discoverer of compound interetheric force, as operating in the animal organism [and] man is a great thinker, and a great student of the capabilities of nature in offering to man's intelligence the means whereby he may discover for himself the secrets she often veils without entirely concealing. The result of more than twenty years of persistent effort to apply etheric force to the operation of machinery has, at last, enabled him to produce continuity of motion in his engine; but, up to this time, he has not so mastered this subtle force as to control reversions. The development of his various discoveries has been one uninterrupted work of evolution, reaching, within the last year, the sphere of perfect vibratory sympathy, both theoretically and practically. The proof of this is found in the fact that he now transmits vibrations along a wire, connected at one end with the vibratory machine which is the source of power, and at its other end with the engine or cannon, as the case may be, which is operated by such vibratory power. Until recently (comparatively speaking) Mr. Keely stored force, as he generated it, in a receiver; and experiments were made by him in the presence of thousands, at various times, for the purpose of testing the operations of 'etheric force', liberated in the presence of his audience and stored up in this small receiver. The Editor of the Scientific Arena thus describes what took place at one of these exhibitions, when he was present: '” 'The confined vapour was passed through, one of the small flexible tubes to a steel cylinder on another table, in which a vertical piston was fitted so that its upper end bore against the underside of a powerful, weighted lever. The superficial area of this piston was equal to one-half of a square inch, and it acted as a movable fulcrum placed close to the hinged end of the short arm of this lever, whose weight alone required a pressure of 1,500 pounds to the square inch against the piston to lift it. 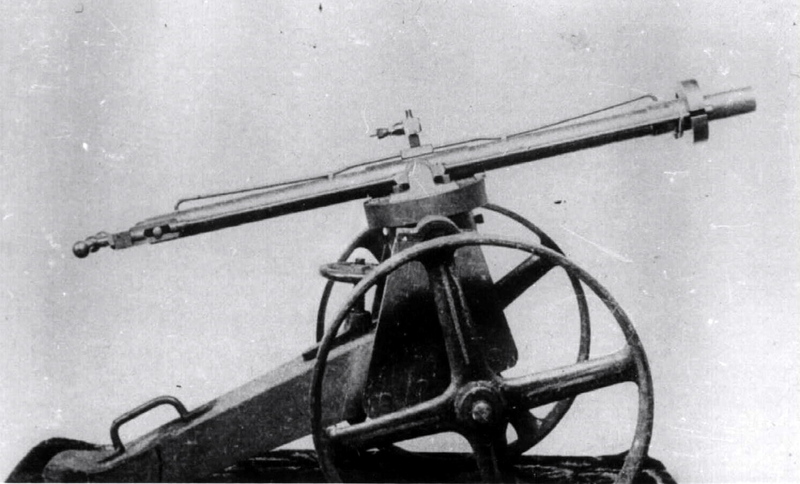 After testing the pressure by several small weights, added to that of the lever itself, in order to determine how much power had already been accumulated in the receiver, the maximum test was made by placing an iron weight of 580 pounds, by means of a differential pulley, on the extreme end of the long arm of the lever. To lift this weight, without that of the lever supporting it, would require a pressure against the piston of 18,900 pounds to the square inch, counting the difference in the length of the two arms and the area of the piston, which we, as well as several others present, accurately calculated. 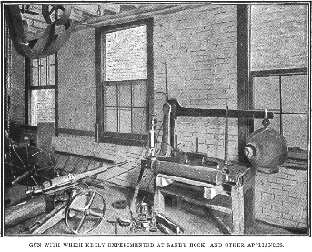 When all was ready, and the crowded gathering had formed as well as possible to see the test, Mr. Keely turned the valve-wheel, leading from the receiver to the flexible tube and through it into the steel cylinder beneath the piston, and simultaneously with the motion of his hand the weighted lever shot up against its stop, a distance of several inches, as if the great mass of iron had been only cork. Then, in order to assure ourselves of the full 25,000 pounds to the square inch claimed, we added most of our weight to the arm of the lever without forcing the piston back again. After repeating this experiment till all expressed themselves satisfied, Mr Keely diverted his etheric gas to the exciting work of firing a cannon, into which he placed a leaden bullet about an inch in diameter. He conveyed the force from the receiver by the same kind of flexible copper tube, attaching one end of it to the breech of the gun. When all was again in readiness he gave a quick turn to the inlet valve, and a report like that of a small cannon followed, the ball passing through an inch board and flattening itself out to about three inches in diameter, showing the marvellous power and instantaneous action of this strange vapour. The difficulty encountered by Mr. Keely in his old generator of etheric force grew out of the fact, in part, that the vaporic power produced was so humid that he could not, when he attempted to utilize it, obtain its theoretical value in work. This difficulty has been entirely overcome by dispensing with the water which he used in liberating etheric force, by his old generator; and, by this departure, he has attained a success beyond that which was anticipated by himself, when he abandoned his original line of experiment. Ignorant, indeed, of the nature of Mr. Keely's work must those men be who accuse him of "abandoning his base" or "principle", each time that he discovers his mistakes, and using them as stepping-stones to approach nearer and still nearer to his goal: reproaching him, even, for keeping his own counsel, until certainty of success rendered it prudent for him to make known that, in changing his field of experiment from positive attraction to negative attraction, he had succeeded in his efforts to produce continuity of motion. Equally ignorant are those, who would wrench by force his secrets from him before the time is ripe for their disclosure. Let us suppose that Faraday, when he discovered radiant matter in 1816, had formed a 'Faraday Phospho-Genetic Radiant Company', to enable him to experiment: fully cognizant of all that Crookes has since discovered, and had taken for his base in experimenting the principle involved in Crookes's discovery. Not succeeding at first, we will suppose that the Company became clamorous for returns, and demanded that his secret principle should be made public. Had he been driven into making it known, who would have credited what Crookes is now able to prove? The effect would have been upon the Faraday Company the same as if a balloon were punctured just as it was soaring heavenward. The same with the Keely Motor Company, had Keely obeyed the order of the Court in 1882, and made his marvellous secret public. It would have collapsed. Therefore, he has maintained his secret in the interests of the stockholders of the Keely Motor Company with a firmness worthy of a Christian martyr. The one person to whom alone Keely has disclosed it thought him a lunatic until he had demonstrated its soundness. When he said, in all solemnity, Now, I feel as if you and I were the god and goddess of this world, the effect upon the hearer was no more than it would have been had a patient in a hospital for the insane spoken the words. If today, for the first time in your lives, you saw a harp, attuned and being played upon, and the science of music was unknown to you, you would hardly expect, without considerable time and study, to be able to reproduce the harp, attune its strings in proper relation to each other, and to play upon it so as to produce the harmonies which you had listened to. Mr. Keely's work is analogous to the illustration which I have presented, inasmuch as he is dealing with the subject of sound, or acoustics, but in a much more involved form than as applied simply for the production of harmonies for the delight of the ear. Mr. Keely's engine is analogous to the mechanism of the human ear, in the respect that it is a structure operated upon, and its motion induced by vibration; and to the end of securing and attaining in and by it uniformity or regularity of motion, there must be perfect unison, or synchronism, as between it and his structure which is the prime source of vibration. To attain this perfect unison or synchronism, has involved unparalleled research and experiment upon his part '” experiments that have varied from day to day. No one, in my opinion, who had not stood by his side, as his shadow, watching every experiment, could have kept fully abreast of him. To pursue my simile, I may say that his harp (engine) is not yet perfectly attuned ('graduated'); when it is so, it will produce nothing but harmony (regularity of motion), and his work will be finished. At such time, I doubt not that he will be able to give to Mr. Boekel, myself or another, the scale with which to reconstruct and attune another apparatus so as to produce like results with it, but to go over the ground that he has gone over, to explore the wilderness in which he has been the pioneer, in other words, the study, to a full understanding of them, of his experiments and researches, as recorded in his writings and illustrated in the beautiful charts which he has produced, will be a work rather for scientists than for mechanicians or engineers. Mr. Keely's 'Theoretical Expose' is nearly ready for the press; and, when these volumes are issued, we may look for a change of attitude toward him in all men who hold themselves ready to abandon preconceived notions, however cherished, if they be found to contradict truth; which Herbert Spencer says is the first condition of success in scientific research. The Rev. J. J. Smith, M.A., D.D., tells us that the only way the great problem of the universe can ever be scientifically solved is by studying, and arriving at just conclusions with regard to the true nature and character of force. This has been Mr. Keely's life study; and he is able to demonstrate all that he asserts. The author of No.5 of the pamphlets issued by The Theosophical Publication Society, What is Matter and What is Force, says therein, The men of science have just found out 'a fourth state of matter', whereas the occultists have penetrated years ago beyond the sixth, and therefore do not infer, but know of, the existence of the seventh, the last. This knowledge comprises one of the secrets of Keely's socalled 'compound secret. It is already known to many that his secret includes the augmentation of energy', the insulation of the ether, and the adaptation of dynaspheric force to machinery. Laurence Oliphant writes as follows on Dynaspheric Force: Recent scientific research has proved conclusively that all force is atomic” that electricity consists of files of particles, and that the interstellar spaces contain substances, whether it be called ether or astral fluid (or by any other name), which is composed of atoms, because it is not possible to dissever force from its transmitting medium. The whole universe, therefore, and all that it contains, consists of matter in motion, and is animated by a vital principle which we call God. Science has further discovered that these atoms are severally encompassed by an ethereal substance which prevents their touching each other, and to this circumambient, interatomic element they have given the name of dynasphere; but, inasmuch as has further been found, that in these dynaspheres there resides a tremendous potency, it is evident that they also must contain atoms, and that these atoms must in their turn be surrounded by dynaspheres, which again contain atoms, and so on ad infinitum. "Matter thus becomes infinite and indestructible, and the force which pervades it persistent and everlasting. This dynaspheric force, which is also called etheric, is conditioned as to its nature on the quality of the atoms which form its transmitting media; and which are infinite both in variety and in their combinations. They may, however, be broadly divided into two categories; viz., the sentient and the non-sentient atoms. Dynaspheric force, composed of non-sentient atoms, is the force that has been already mechanically applied by Mr. Keely to his motor; and which will probably, ere long, supersede the agencies now used for locomotive, projectile, and other purposes. When the laws which govern it come to be understood it will produce materially a great commercial and industrial revolution. There is no hard-and-fast line between the sentient and the non-sentient atoms; just as zoophytes are a connecting link between the animal and vegetable creation, so there is a graduated scale of atoms, between atoms which although animated by the divine life are not sentient, and those which are as highly developed, relatively to them, as man is to a cabbage. The most remarkable illustration of the stupendous energy of atomic vibratory force is to be found in that singular apparatus in Philadelphia” which for the last fifteen years has excited in turn the amazement, the scepticism, the admiration, and the ridicule of those who have examined it ” called 'Keely's Motor'. In the practical land of its origin, it has popularly been esteemed a fraud. I have not examined it personally, but I believe it to be based upon a sound principle of dynamics, and to be probably the first of a series of discoveries destined to revolutionize all existing mechanical theories, and many of the principles upon which they are founded. Those who are sufficiently unprejudiced to connect the bearings of this discovery, of what must be dynaspheric force, with phenomena which have hitherto been regarded as supernatural by the ignorant, will perceive how rapidly we are bridging over the chasm which has divided the seen from the unseen, obliterating the distinction between 'matter' and what has most erroneously been called 'spirit'. In 1882 a lady, conversing with Mr. Keely, said, You have opened the door into the spirit-world. He answered, 'Do you think so? I have sometimes thought I might be able to discover the origin of life. At this time Mr. Keely had given no attention whatever to the occult bearing of his discovery; and it was only after he had pursued his researches, under the advantages which his small Liberator afforded him for such experiments, that he realized the truth of this woman's assertion. It was then, in 1887, that a 'bridge of mist' formed itself before him, connecting the laws which govern physical science with the laws which govern spiritual science, and year by year this bridge of mist has solidified, until now he is in a position to stand upon it, and proclaim that its abutments have a solid foundation '” one resting in the material and visible world, and the other in the spiritual and unseen world; or, rather, that no bridge is needed to connect the two worlds, one law governing both in its needed modifications. The physical thing, writes a modern scientist, which energises and does work in and upon ordinary matter, is a separate form of matter, infinitely refined and infinitely rapid in its vibrations, and is thus able to penetrate through all ordinary matter, and to make everywhere a fountain of motion, no less real because unseen. It is among the atoms of the crystal and the molecules of living matter; and, whether producing locked effects or free, it is the same cosmic thing, matter in motion, which we conceive as material energy, and with difficulty think of as only a peculiar form of matter in motion. Oliphant, commenting upon this view of energy, says: This is nothing more nor less than what we have been in the habit of calling 'spirit'. Mind is also composed of this extraordinary matter; so is will; so is every emotion. Jacob Boehman calls it heavenly substantiality, and Swedenborg calls it natural and spiritual atmospheres, composed of discrete substances of a very minute form. Professor Crookes has invented the word protyle, Professor Cones calls it soul-stuff, or biogen; while Occultists call it astral fluid. To all who are conversant with Mr. Keely's theories a similarity of views will be evident. Notwithstanding the properties of these elements have been studied, and are now known with a degree of precision formerly undreamt of, have the atoms of our present elements been made to yield? He continues: A negative answer must undoubtedly be given, for even the highest of terrestrial temperatures, that of the electric spark, has failed to shake any one of these atoms in two. This is an error, for it is well known by those who are fully acquainted with the principle involved in Keely's inventions that the intense vibratory action which is induced in his Liberator has accomplished what the retort of the chemist has failed to do, what the electric spark has left intact, and what the inconceivably fierce temperature of the sun and of volcanic fires has turned over to us unscathed. The mighty Geni imprisoned within the molecule, thus released from the chains and fetters which Nature forged, has been for years the tyrant of the one who rashly intruded, without first paving the way with the gold which he has since been accused of using in experiments with reckless and wanton waste! For more than a score of years has Keely been fighting a hand-to-hand fight with this Geni; often beaten back by it, paralysed at times, even, by its monstrous blows; and only now so approaching its subjugation as to make it safe to harness it for the work that is calling for a power mightier than steam, safer and more uniform in operation than electricity; a power which, by its might and beneficence, will ameliorate the condition of the masses, and reconcile and solve all that now menaces our race, as it was never menaced before. The structure of the air molecule, as believed in by Keely, is as follows. Broken up, by vibratory action, he finds it to contain what he calls an atomic triplet. The position of a molecule, on the point of a fine cambric needle sustains the same relation to the point of the needle that a grain of sand sustains to a field of ten acres. Although, as Sir Henry Roscoe has said, 'In nature there is no such thing as great or small'. the human mind cannot conceive such infinitesimal minuteness. We will then imagine a molecule magnified to the size of a billiard ball, and the atomic triplet magnified to the size of three marbles, in the triangular space which it always sustains within that molecule, at its centre, unless acted upon by electricity, when the molecule (the billiard ball) becomes oblate, and the three (marbles) are ranged in a line within unless broken up by the mighty force of vibratory action. Nature never gives us a vacuum; consequently, the space within the molecule not occupied by the atomic triplet must be filled with something. This is where the Geni” the all-pervading ether” has made its secret abode through untold aeons, during which our world has been in course of preparation for its release, to fulfill its appointed task in advancing the progress of the human race. Step by step, with a patient perseverance which some day the world will honour, this man of genius has made his researches, overcoming the colossal difficulties which again and again raised up in his path what seemed to be (to all but himself) insurmountable barriers to further progress: but never has the world's index finger so pointed to an hour when all is making ready for the advent of the new form of force that mankind is waiting for. Nature, always reluctant to yield her secrets, is listening to the demands made upon her by her master, necessity. The coal mines of the world cannot long afford the increasing drain made upon them. Steam has reached its utmost limits of power, and does not fulfill the requirements of the age. It knows that its days are numbered. Electricity holds back, with bated breath, dependent upon the approach of her sister colleague. Air ships are riding at anchor, as it were, waiting for the force which is to make aerial navigation something more than a dream. As easily as men communicate with their offices from their homes by means of the telephone, so will the inhabitants of separate continents talk across the ocean, Imagination is palsied when seeking to foresee the grand results of this marvellous discovery when once it is applied to art and mechanics. In taking the throne which it will force steam to abdicate dynaspheric force will rule the world with a power so mighty in the interests of civilization, that no finite mind can conjecture the results. Laurence Oliphant, in his preface to 'Scientific Religion', says: A new moral future is dawning upon the human race '” one, certainly, of which it stands much in need. In no way could this new moral future be so widely, so universally, commenced as by the utilizing of dynaspheric force to beneficial purposes in life, thus revealing to all men another phase of God's underlying purpose. In 1746, when Franklin's attention was drawn to the phenomena of electricity, little more was known on the subject than Thales had announced two thousand years before. Von Kleist in Leyden, Collinson in London, and others in as widely-separated cities in Europe, were experimenting in the same field of research. What our last century has done toward subduing this tyrant which Franklin succeeded in bringing down to earth, from the clouds, the next century will see surpassed beyond man's wildest conjectures, should Mr. Keely's utilization of dynaspheric force bestow upon humanity the costless motive power which he anticipates it will. Reynolds predicted that those who 'studied the mysteries of molecular vibration would win the victorious wreaths of successful discovery. After such discoveries as Mr. Keely has made in this field of research, it matters not to him whether he succeeds commercially or not. His work of discovery commenced when, as a boy of twelve, he held the sea-shells to his ear as he walked the shore and noted that no two gave forth the same tone. From the construction of his first crude instrument, his work of evolution progressed slowly for years; but within the last five years he has made giant strides towards the Dark Tower which is his last fortress to take. When he is ready, Dauntless the slug-horn to his lips he will set; and the world will hear the blast, and awaken from its slumber into new life. Molecular vibration is thus seen to be, Keely's legitimate field of research; but more than once has he had to tear down portions of the vibratory scaffolding which aided him in the building up of his edifice of philosophy; therefore, he is ever ready to admit that some of his present scaffolding may have to be removed. The charge of abandoning his base' recently brought against him by one of the editors of The New York Times, could only have been made by one who is utterly ignorant of the subject upon which he writes. Under the heading A Cool Confession, this editor asserts that Mr. Keely has given up the Keely Motor as a bad job, and that he admits that he is a bogus inventor and a fraud. This is not true. What Mr. Keely does admit is that, baffled in applying vibratory force to mechanics, upon his first and second lines of experimental research, he was obliged either to confess a commercial failure, or to try a third departure from his base or principle; seeking success through another channel of experiment. While experimenting upon this third line, until his efforts were crowned with success, he kept his secret from all men; with the approbation of the one who furnished the money for these experiments. This was a time when silence is golden; and the charge made by the same editor that Keely had been receiving money from the Keely Motor Company on false pretences from the time that he abandoned his original plans, could only have been made by one who knows nothing of the facts of the case: for years have passed away since the Keely Motor Company broke its contract with him, and since it has furnished him with any money for his experiments. In considering the operation of my engine, the visitor, in order to have even an approximate conception of its modus operandi, must discard all thought of engines that are operated upon the principle of pressure and exhaustion, by the expansion of steam or other analogous gas which impinges upon an abutment, such as the piston of a steam-engine. My engine has neither piston nor eccentrics, nor is there one grain of pressure exerted in the engine, whatever may be the size or capacity of it. My system, in every part and detail, both in the developing of my power and in every branch of its utilization, is based and founded on sympathetic vibration. In no other way would it be possible to awaken or develop my force, and equally impossible would it be to operate my engine upon any other principle. All that remains to be done is to secure a uniform speed under different velocities and control reversions. That I shall accomplish this is absolutely certain. While some few years ago, I contemplated using a wire as a connective link between two sympathetic mediums, to evolve my power as also to operate my machinery” instead of tubular connections as heretofore employed” I have only succeeded but recently in accomplishing successfully such change. This, however, is the true system; and henceforth all my operations will be conducted in this manner” that is to say, my power will be generated, my engines run, my cannon operated, through a wire. It has been only after years of incessant labour, and the making of almost innumerable experiments, involving not only the construction of a great many most peculiar mechanical structures, and the closest investigation and study of the phenomenal properties of the substance 'ether', per se, produced, that I have been able to dispense with complicated mechanism, and to obtain, as I claim, mastery over the subtle and strange force with which I am dealing. 'When my present process of adjustment is completed, the force, the mechanism, and all that pertains to it, will be fully explained in a theoretical exposition of the subject, with appropriate diagrams, which I shall publish to the world ; through which medium, and my patents, when taken out, a knowledge of all that is required for its commercial employment will be more easily acquired than is the necessary skill required to enable one to safely operate a steam-engine. 'My power will be adapted to engines of all sizes and capacities, as well to an engine capable of propelling the largest ship as to one that will operate a sewing machine. 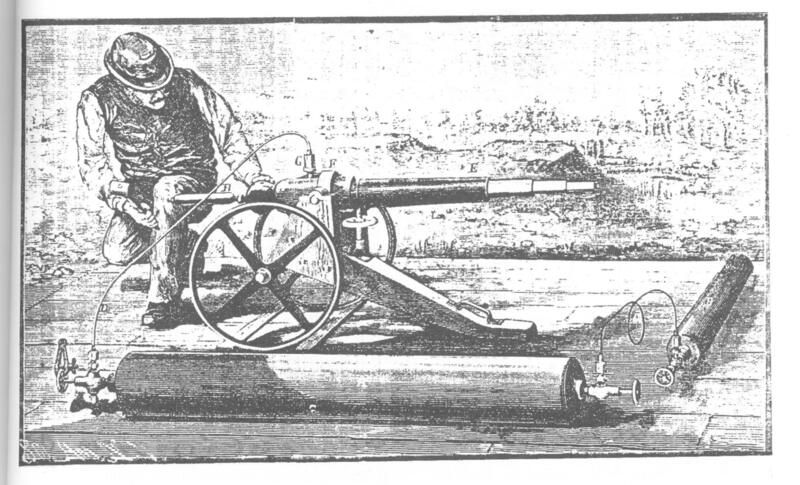 Equally well and certain is it that it will be adapted as a projectile force for guns and cannons of all sizes, from the ordinary shoulder-piece to the heaviest artillery'. Mr. Keely has named this new modification of the one force in nature 'Negative Attraction', which to the uninitiated suggests no more (and not so much) than if he had called it 'Exploded Humbug'. The two forms of force which he has been experimenting with, and the phenomena attending them, are the very antithesis of each other. Mr. Keely does not feel the shadow of a doubt as to his eventual success in producing engines of varying capacities; small enough, on the one hand to operate sewing machines with, and large enough, on the other hand, to propel the largest ships that plough the seas. 'Every fact and feature surrounding the case warrants the belief, notwithstanding the incredulity of all who have not witnessed the progress of Mr. Keely, step by step, that his success will be complete, and his work stand as the most colossal example of the survival of the fittest, in the process of inventive evolution'. Cox says: 'Not one of the great facts which science now accepts as incontrovertible truths but was vehemently denied by the scientists of its time: declared to be a priori impossible, its discoverers and supporters denounced as fools or charlatans, and even investigation of it refused as being a waste of time and thought'. 'History repeats itself', and Amiel's definition of science gives the key to the incredulity of scientists in reference to Mr. Keely's discovery; for if, as Amiel has said, 'science is a lucid madness occupied with tabulating its own hallucinations', it is not strange that men of science should refuse to investigate what they consider the hallucinations of others. It is an undisputed fact that 'too much has been conceded to science, too little to those sublime laws which make science possible'. But the one law which regulates creation (and to which all other laws are made subservient), keeping in harmony the systems upon systems of worlds throughout space, developing sound and color, animal and vegetable growth, the crystallization of minerals, is the hidden law, which develops every natural science throughout the universe; and which both Kepler and Newton anticipated would be revealed in our age. 'You can even trace the poles in sound', writes Mrs. Hughes (a niece of Darwin), in her work upon the 'Harmonies of Tones and Colours - Developed by Evolution'. The experiments made by Mrs. Watts Hughes, at the annual Reception of the Royal Society, and the [A system of Pendulums tuned to swing the various ratios of the musical scale, form a 'Silent Harp' of extraordinary interest. This 'Silent Harp,' D.C. Ramsay, of Glasgow has shown to his students of harmony for many a year. A pen, placed by means of a universal-jointed arrangement between any two Pendulums of this 'Silent Harp', so as to be moved by a blend of their various motions, writes, with all the precision of gravitation, a portrait of the chord which two corresponding strings of a sounding harp would utter to the ear. This spiral writing is a Pendulograph; exquisite forms such as no human hand could trace] Pendulograph writings by Andrews of Belfast have a bearing upon Mr. Keely's discovery; illustrating the workings of this hidden law. Of all women Mrs. Hughes approaches nearest to the theories of Mr. Keely. Concerning them she writes to a friend well versed in music, as music is taught: '” 'From ignorance of the present Science of Musicians, which you know so thoroughly, it is far easier for me to grasp his meaning, than for you. I have lately been proving by scriptural types how Nature's laws in the lower creation develop by fifths below and by fourths above the keynote, the two meeting in one harmony: art mingling both, creating discords, and undulating them into harmony. Dr. C. Martin says: '” 'Musicians must have discords; the ear is educated to them: but every one must allow that the nearer Art follows nature, the more perfect it is'. Mrs. Hughes adds: 'I think Keely must have caught the centre where both laws unite, or act upon Nature's law only'. Of the law of periodicity, Hartmann writes: 'Its actions have long ago been known to exist in the vibrations producing light and sound and it has been recognized in chemistry by experiments tending to prove that all so-called simple elements are only various states of vibration of one primordial element, manifesting itself in seven principal modes of action, each of which may be sub-divided into seven again. The difference which exists between so-called single substances appears, therefore, to be no difference of substance or matter, but only a difference of the function of matter in the ratio of its atomic vibration'. It is by changing the vibrations of cosmic ether that Mr. Keely releases his power, and Dr. Kellner in Austria produces electricity in the same way; while it is said that a chemist in Prague produces magnetism; also Dr. Dupuy, of New York, who has been for years experimenting in this field without meeting with Keely's progressive successes. Horace Wemyss Smith, in commenting upon the fact that, at the time of Franklin's discovery, men in France, in Belgium, in Holland, and in Germany were pursuing the same line of experiment, says that there is something worthy of observation in the progress of science and human genius, inasmuch as in countries far distant from each other men have fallen into the same tracks, and have made similar and corresponding discoveries, at the same period of time, without the least communication with each other. Laurence Oliphant's recent works give us the clue to an explanation of this fact; and Lowe, in his 'Fragments of Physiology', condenses the answer in these words: 'Man is not the governor and commander of the created world; and were it not for superhuman influence constantly flowing into created forms, the world would perish in a moment'. It is this superhuman influence, felt most by those who have educated the hidden sense (with which all men are born), which inspires all discovery, all invention, all poetry, all of truth, let it take whatever form it may. This sixth sense is as much undeveloped in the mass of mankind as sight would be had we been born with our eye-lids sealed; able to distinguish nothing beyond the period of day-light from the reign of night, and remaining sealed all the years of our life upon earth. We know that some spiritually minded persons seem to possess powers unknown to those who are spoken of in Scripture as 'the carnal minded'; and it may be that with dim vision they are able to discern 'as in a glass darkly', without education of this hidden sense, truths which are hidden from others. Of such are our men and women of genius. Again, there are others who possess uncertain, unreliable powers, which often lead astray those who commit themselves to the direction of these powers. What does this prove beyond the fact that a human being is never an infallible medium of superhuman influence? 'Spiritualism' represents a great truth, behind the 'spiritism' which stands in the same relation toward it that counterfeit coin holds to sterling gold. The operations of our sixth sense are as liable to be deceptive as are the operations of our other senses; and are limited or governed by law in the same way. We cannot see in total darkness, and this hidden power, susceptible of education, can only be brought into use by an illuminated mind; a mind that has studied the laws of evolution and involution, the descent of spirit into matter, and the re-ascension of matter to spirit '” laws of the life impulse beginning in the elemental kingdom and ending in an evolution of man, far beyond the comprehension of man of the present day. 'Man and woman as units', continues Oliphant, 'are still so ignorant of the great powers which they themselves inherit that they wholly fail to see them, though they sweep like mighty seas throughout all human nature'. When mankind has become sufficiently spiritualized by the process of evolution laid down in the plan of the great Master, then shall we know ourselves and our powers as we are known to Him. True Science must first open wider the path of religion '” a religion of progress, a religion suited to the wants of humanity, as well as a humane religion '” the religion, taught by our 'Holy Master', of love for our fellowmen, of harmony with all that is good '” at war only with evil; not with those who, warped by transmitted tendencies, commit the evil. 'An eye for an eye, a tooth for a tooth', is the old Jewish law. Christ's law is the law of love, which is God's law. 'Do unto others as ye would have others do unto you'; and this is the law which we need to fulfill, in order to purify and regenerate mankind. Hitherto we have been, in one respect, like the labourer in Tolstoi's 'Confession', doing the work assigned him, in the space assigned, without understanding where he was, or what the result would be, and unable to judge whether the arrangements for this work were reasonably planned by his master or not. The labourer worked the handle of the pump, he saw the water flow into numerous channels for irrigation of the soil; little by little, shrubs grew and blossomed and bore fruit, and the labourer passed on to more important work, understanding better and better the arrangement of the establishment, and never doubting that its Lord had planned all for the best. Our race has been pumping the water for generations, planting the seed, watching the growth of the plants, the shrubs, and the trees; not always satisfied, however, that the Creator of the universe had planned as well as all might have been planned, or that there was any plan, or any Creator. There are men in various parts of the world, unknown even by name to each other, who tell us by 'the signs of the times' that the season of harvesting is approaching; the season for gathering the fruit, which has been deferred, century after century, because mankind is not yet ready, in the opinion of many, to share the fruit with one another. Hyndman says that capitalism has been as necessary as serfdom in the progress of the human race; and its stores will continue to be garnered and used to spread the great network of railways, steam navigation, telegraph and telephone lines, which have given bread to millions upon millions; encouraging paid labour and bringing nearer and nearer the age of love and harmony, which, it has been predicted that the twentieth century will usher in. Renan, the French theologian, writing of the advances to be made in science by the discovery of nature's secrets, said that, although he had ceased to look forward to anything very unexpected, he envied those who should live to see the wonders of the twentieth century. 'For', he added 'they who live then will see things of which we have no conception. Already the light of a new dawn is breaking upon the world of science'. These foretold advances are heralded by the new modifications of force, before alluded to. The instrument invented by Dr. Kellner collects and produces electricity directly from the ether of the atmosphere without any friction of solid corporeal substances and without any chemical agency; the invention of one of the Prague professors, which, it is said, collects and gives out magnetism, seeming to be derived from changing the vibrations of cosmic ether, as in Keely's and Kellner's experiments, and other more recent discoveries. It has been said that when Keely's vibratory force shall have taken the place of steam-engines, the millions of working men who gain with difficulty their daily bread by the work of their hands, will find themselves without occupation. The same prediction was made in regard to steam, but instead we find the city of Boston giving work to thirty thousand men in one manufactory of boots and shoes by steam, in place of the three thousand shoemakers who were all that were occupied in this branch of labour in that city when the work was done by hand. Dr. Kellner's colleague, Franz Hartmann, M.D., writing to me in reference to Keely's discovery, says: 'I have taken great interest in him ever since I first heard of him in 1882. I believe that the world is entering into a new era of existence, and will become spiritualized from top to bottom. As gaslight has driven away, in part, the smoky petroleum lamp, and is about to be displaced by electricity, which in the course of time may be supplanted by magnetism, and as the power of steam has caused muscular labour to disappear to a certain extent, and will itself give way before the new vibratory force of Keely, likewise the orthodox medical quackery that now prevails will be dethroned by the employment of the finer forces of nature such as light, electricity, magnetism,' etc. When the time is ripe, these are of the true scientists who will come to the front 'to lead as progress leads', men who know how to wait upon God, viz., to work while waiting; and to such the end is, sooner or later, victory! 'God never hurries'. He counts the centuries as we count the seconds, and the nearer we approach to the least comprehension of His 'underlying purpose' the more we become like Tolstoi's labourer, who knew that the fruit was ripening for him and his fellow-men, trusting implicitly in the superior wisdom of his master. From their cloud, Our doctrines make no way'. No man, whose spiritual eyes have been opened to 'discern the signs of the times', can doubt that we are on the eve of revelations which are to usher in the dawn of a brighter day than our race has yet known.